Nearly 400,000 American women served in World War II. The majority of women in the war held office jobs. Although much less dangerous than being on the front lines, these jobs were essential. By filling office jobs that would otherwise be held by men, women freed more men to fight. The sheer number of women who joined the military helped the movement for greater gender equality. Women’s participation in the US Armed Forces during World War II was a major turning point in the relationship of women to the military. The initial response to the idea of enlisting women met enormous resistance. As the war escalated and the national pool of qualified male draftees dwindled, it became clear that for every woman recruited, one less man had to be drafted…On more than one occasion, the Army became so desperate for women that its leaders seriously considered requesting Congressional approval to draft them. 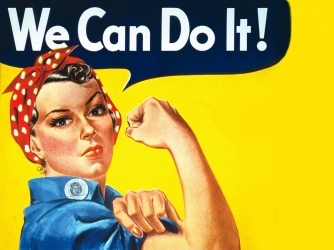 It was during this time that the government launched their Rosie the Riveter campaign, urging women to join the workforce. The very first time I visited the Redford Twp Historical Commission museum, my eyes were drawn to a large bronze plaque in one of the corners. The memorial plaque lists all the students from Redford High School that died during World War II. In total, 95 names. My heart sank. I can’t fathom a time where 95 students from my high school would pass a away in just a few years time. As I scrolled down the list of names, I couldn’t help but notice one name in particular…Helen Amick. The only female on the plaque. More than 400 women lost their lives as a result of the war. Helen was one of those women. Sgt Helen Johnston was born May 12, 1924 in Guernsey Co., Ohio. By 1930, Helen and her family were living in Detroit. She was a 1943 graduate of Redford High School, where her classmates knew her as Helen Amick. Right after graduation she was admitted to the Mercy Hospital School of Nursing in Hamilton, OH. Then, in 1944, just 5 days after turning 20, she enlisted in the Army. According to a family member, Helen was “a WAC [Women’s Army Corps] stationed in London during WWII. After the war she was transferred to Paris. Shortly before coming home she had gone to arrange passage for her dog. On the return trip her jeep ran into a stone wall and she was killed.” She died on March 25, 1946. We thank Sgt Johnston for serving our country! We are still looking for more information on Helen. If anyone remembers her or has additional information, please let us know. View Helen’s memorial on findagrave.